Architect Eugene Tssui has seen several projects built, including a fish-shaped home in Berkeley and a blob-like school at Harbin Hot Springs. About to be built is a zero-energy demonstration building in San Pablo. But Tssui, who splits his time between the Bay Area and Beijing, is best known for thinking big. For San Francisco he designed the Ultima Tower, two miles high and a square mile around at its base, big enough to house a million people. "The entire population in a one-square-mile footprint," he says. "Wouldn't that be incredible?" 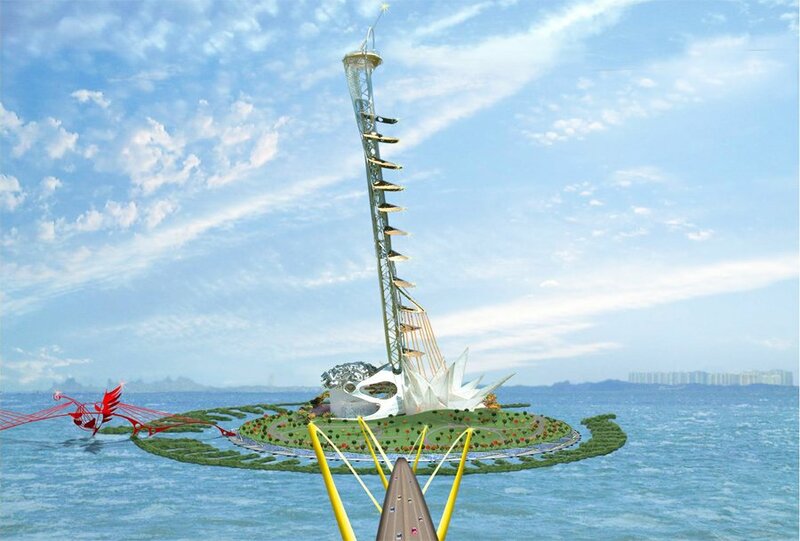 His Eye-in-the-Sky Tower for Oakland would be a view tower and tourist attraction, as tall as two Eiffel towers and affording views, he promises, to Mount Shasta. Two structures at the bottom, including the Crystal Exhibition Hall, would provide environmental education. Tssui, whose Eye-in-the-Sky would have been the tallest structure in the world (a variant was designed for Shenzen, China), regrets that it remains on the drawing board. "But that doesn't mean it will never be built," he says. "Some of my designs will be built in the future. I know it. It's all about the power of the idea." We remember it today as the Roaring 'Twenties, but folks back in the 1920s rolled as well as roared—often at the same time. It was 'the golden age of the roller coaster,' with nearly 2,000 constructed in the United States alone. The Depression put an end to the roller coaster boom—but not to roller coaster dreamers. Such a one was Joseph Bazzeghin, an architect from Connecticut. In 1938, as preparations were underway for the Golden Gate International Exposition on Treasure Island, Bazzeghin presented a plan for a pair of roller coasters, not of the standard wood but of steel. The plan made use of two recently built, strikingly prominent pre-existing steel structures—the Golden Gate Bridge and the San Francisco Bay Bridge. 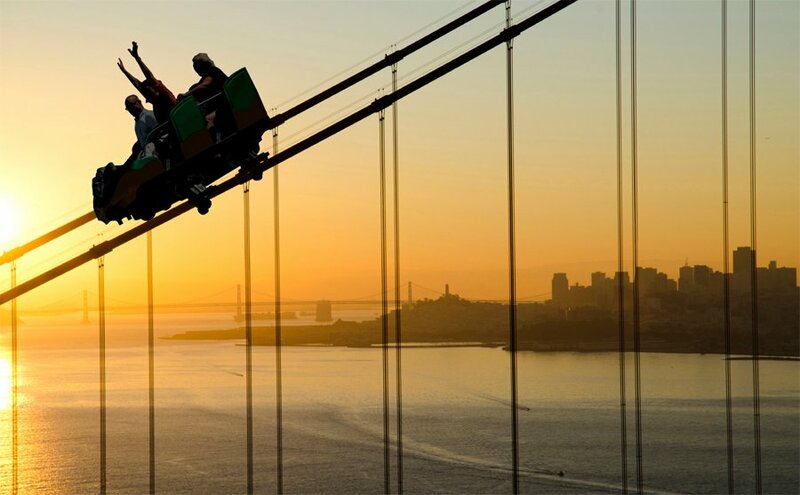 The Golden Gate Bolt (simulated above), as Bazzeghin dubbed the coaster on the Golden Gate Bridge, would have sent thrill-seekers on the most exciting ride of their lives—and probably their last. Seated four abreast in open cars—but with windshields, praise heavens—riders would have plummeted down the suspension cable from the south span, hitting speeds of 200 miles per hour or more, right on up to the north tower, before making landfall in Marin County. The Bay Bridge Bolt added to the fun by sending the ride's high flyers through an underwater tube after descending the cables. Unfortunately, Bazzeghin wrote, the plans were scotched by the "usual resistance which obstructs the acceptance of all new ideas."